This Lickable Treat is made with Tender pieces of chicken combined with peas, carrots and corn in a rich, delicious stew sauce. 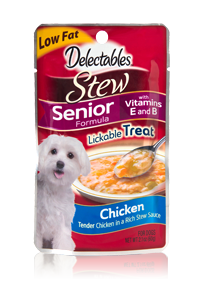 Added Vitamins E and B help support the needs of older dogs. It’s also a great topper for dry food! Mixes easily and is sure to have your dog gobbling up every last bite.